It would have run between M1 and A1. M1 and A1, eh? Well, is this an old number for M18? How about that new bit of the M1, that joins the old M1 to the A1? Well, in which case - it's got to be the M62 then. So, what's the story here? Why was it once a different number, but is now just a part of the M62? Let me get one thing out of the way. By the time construction started, it was already renumbered as M62. There are no maps that show M19, except for those from Government documents tucked away in various archives. The M19 is a victim of changing circumstances, of altered planning, of fate. Hey, I could write tag lines for Hollywood! The early plans for a Lancashire - Yorkshire motorway had a different route to the modern M62, south of Dewsbury and Batley, rather than the sudden northwards lurch that the modern route takes. However, the section between M1 and A1 (where the route then ended) started roughly near the current M1/M62 interchange, and then headed north of Castleford before meeting the A1 just north of the village of Fairburn. Travelling along the east-west route, there would have been a "dog-leg" in the route. Or in modern terms, a TOTSO. So, saying it's part of the M62 isn't terribly accurate then? Perhaps it's more accurate to say that it's part of the predecessor idea to the modern M62. Anyway, take a look at the routing. Well, the plans for the M62 west of M19 changed to re-route north of Batley, meaning that there was no longer the dog-leg along the M1. 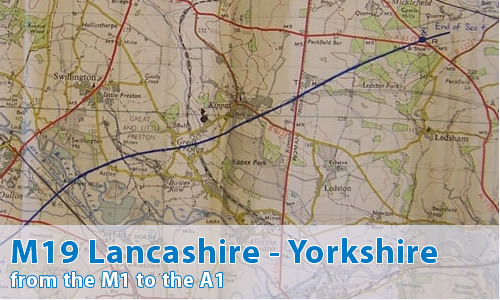 A short while later, in a bright spark of inspiration, someone at the Ministry worked out that no longer were two numbers required for the route - although there are some documents that exist showing both M62 and M19, with the dog-leg removed. And the Prince and Princess got married, and everyone lived happily ever after. Apparently. Perhaps this explains why Lofthouse is a roundabout, when the decision to move the M62 north and take over the M19 was made, they used what may have been the original junction, and just added the route from the west onto the plan, rather than rethinking the whole thing.